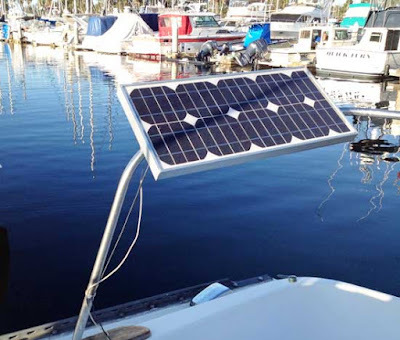 Captain Curran's sailing blog: Solar panels for boats: an easy installation guide. 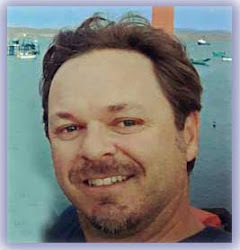 In this article, I provide simple instructions for mounting solar panels on sailboats or powerboats. 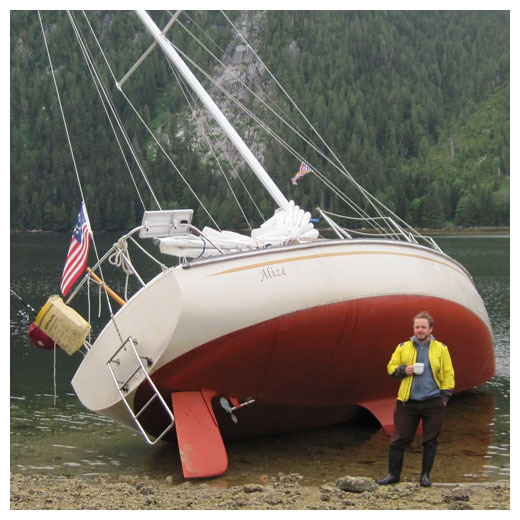 When I first started sailing, I often found myself stranded at sea with a dead battery and no way to start my diesel engine. This is not fun or safe... I was using too much electricity and dragging my 12 volt battery down below 10 volts. Finally, while sailing north to Alaska, I fixed this problem by installing this basic, solar panel boat system. I love the idea of people generating their own energy - so I'm thrilled to see that thousands of people visit this page each year. I installed the following set-up a few years ago, and everything is still working great (it's now 2018 as I update this article). I update this page each year, to make sure all my recommendations are accurate and relevant. Below, I'm writing basic 'Do-It-Yourself' instructions to install solar panels for boats. 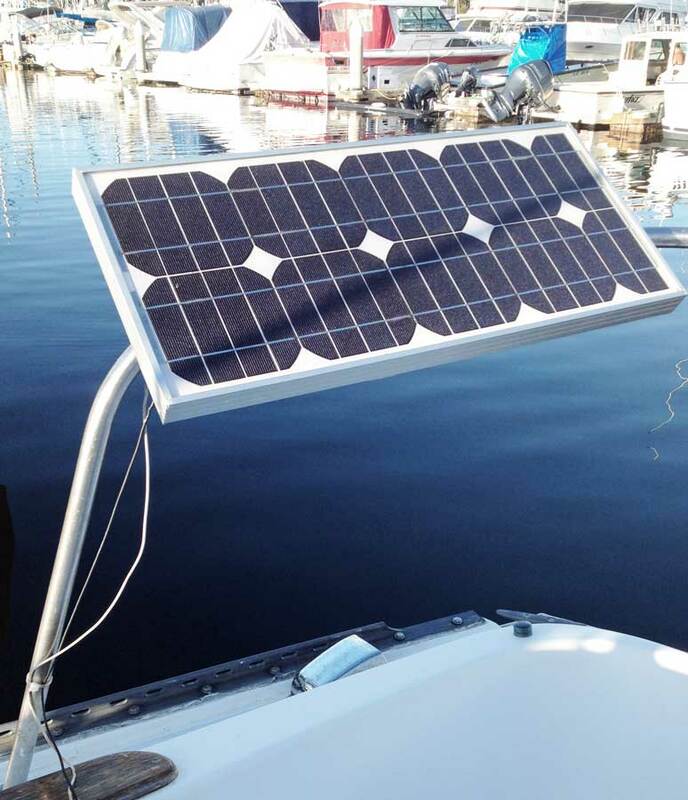 All parts total cost me about $240, which is a great price to mount solar power on your boat. And it should be noted that I haven't skimped on quality, all the gear I use is well-respected, long-lasting stuff. I am writing the following instructions for boat people or RV campers. I describe a basic set up that provides a charge onto your 12 Volt DC battery bank. If you want to use this system to power your home, then you'll also need an inverter to switch the 12 Volt DC electricity to 110 Volt AC. The set up I describe is perfect for keeping batteries topped off while you're disconnected from shore power. This means that while you're out fishing, sailing or anchored out for the evening - you can run your electronics (cell-phone charger, navigation lights, stereo, cabin lights, bilge pump, depth-finder, GPS ext...) and still have enough power on your batteries to start the engine and get you home. 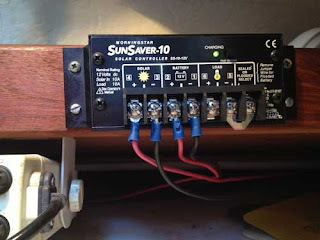 Ok, here's my simple DIY instructions for solar installation on a boat or an RV camper. First I list a quick summary on how to put this together. Details will follow after these instructions. 1. Mount your panel on your stern rail (see photos/details below). 2. 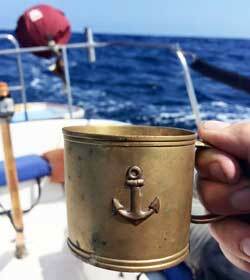 Attach marine grade copper wires to the panel. These are DC wires for a 12 Volt system, so you need 2 sets of wires (black and red). Black (negative) and red (positive). If this set-up is for a RV camper then you don't need to spend more for these marine grade wires. 3. Run the wires into the main cabin (this usually means drilling a small hole in the cockpit). 5. Attach a new set of the same style of marine grade wires from the controller to your battery. 6. The red (positive) goes on the Positive terminal, the black (negative) goes on the Negative terminal. 7. Crack a beer and relax while the sun tops off your batteries! FAQ: What size panel should I get? When I was planning what boat solar gear to buy, the consensus opinion was that a 30 watt panel was sufficient for my boat. My electrical needs are considered 'light'. My electronic guru friend in Seattle pointed me to the 30-Watt Solar Panel featured in the photo above. Size-wise, it's compact (13x24 inches), which is nice, since it doesn't take up much space on the stern rail. If you average 5 hours of sunlight/day X 30 watts = 150 watt-hours per day. A 30W panel will give you about 1.8 Amps for 5 hrs a day. That is 9 Amp hours a day. I have used my 30W panel in Seattle and San Diego, so the whole range of sun/cloud conditions and the 30 watt output has provided enough juice for me to use my electronics (stereo, GPS, depth-finder, cabin lights, cell phone charger, ext.) and keep my battery bank topped off. (I've got two 12 Volt batteries in my battery bank, a deep cycle and a starter). FAQ: Which brand of solar panel is best? Now, in regards to what panel to install... there's currently a bunch of high quality solar panels on the market. The industry is changing pretty fast, panel technology/efficiency keeps improving. 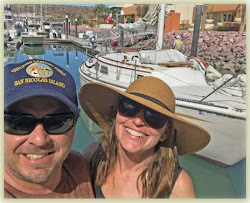 Earlier this year, Jan 2018, as I was updating this page, I surveyed my boat and RV friends to see what panel they like best right now. Maybe 80 percent of them said they still like the Renogy panels. 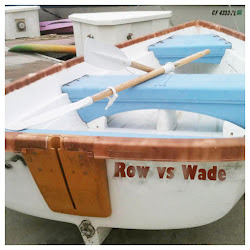 These panels are rugged, which is good for boats, they withstand stormy conditions. Plus you get a high quality panel (Amp. output) for the price. In that case, go with a 100 watt panel. Their 100 Watt Solar Panel is the preference for mid-size boats with moderate amperage needs. Campers/RV or folks who have an off-the-grid cabin also seem to like this model. Size-wise, the 100 watt panel is only about 45 inches by 20 inches. So, it should fit fairly well on your stern rail or RV rooftop. And....if you want even more juice from the sun, then get a pair of these 100 watt panels and wire them together. Each panel yields 100 watts, so mount 2 for 200 watts total. 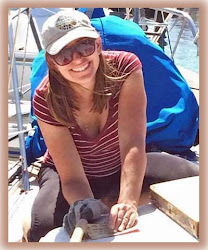 Last month I helped a friend put a 100 watt on his 38 foot sailboat. We mounted it on the railing that sits on top of his canvas dodger (over the cockpit). He's happy with the output. 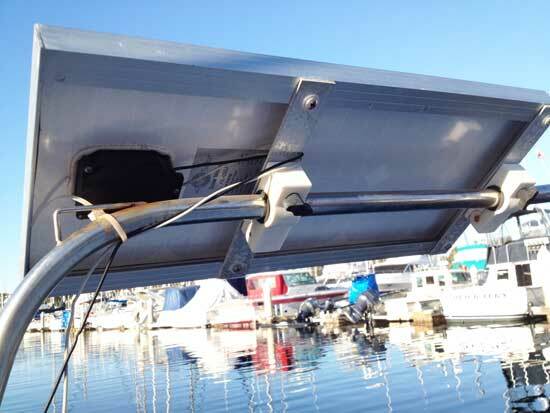 We used the compatible solar panel mounting bracket set to lock the panels onto his boat. Here's the 100 watt panel on Amazon. FAQ: Do I need a controller? Yes. The controller is necessary for controlling the charge coming off the panel. It is a small circuit panal that is installed between the solar panel and your batteries. It enables the charge to be fed to the batteries at the right levels. It also prevents your batteries from leaking charge back out to the panel and it also prevents over-charging the battery. You need a controller, its not optional. It's a simple device, but it's critical and you want a good quality controller. My guy at Fisheries Supply in Seattle told me to go with the Morningstar SunSaver-10, Charge Controller, 12V. I've had it in use for 6 years and it's worked flawlessly for me (see photo below). There's no moving parts here, its just diodes and fixed circuits. When the sun is shining, you get a green LED light on the top of the controller (see photo). This indicates that charge is going onto the batteries. I'm expecting this controller to last me another 10 years. As you can see, it mounts easily inside your boat with 4 stainless steel screws. I placed mine right above my chart table. Here's a link to that controller. FAQ: How did you mount your panel on your stern rail? DISCLAIMER: Every panel design will require a slightly different mount. The Renogy panels I mentioned above come with their own mounting brackets. This is probably preferred since their mounting brackets are only 15$. But, apparently I like to do things the hard way. I went the 'Do-it-yourself' route and built my own mounting brackets to fit my stern rail. If you want to do what I did, here's how I did it. My panel has an aluminum rail on the perimeter. Drill holes in this rail and attach 2 aluminum flats to serve as a center mounting rail. Attach these strips of aluminum with stainless bolts and nuts. To prevent galvanic corrosion (aluminum touching steel) use plastic washers. Then, attach these white plastic rail mounts to the new aluminum flats (or something similar). The beauty of these plastic rail mounts is you can adjust their tightness on your boat's stern rail. Therefore, you can push the panel around it's axis so that the panel is facing the sun throughout the day. FAQ: How do you wire up the panels/controller/battery? Okay, let's assume your panel is now mounted. Next thing is, connect the panel to the controller (the controller will be installed inside the boat). Get yourself some Marine Grade copper wire. Get at least 30 feet of black and 30 feet of red. 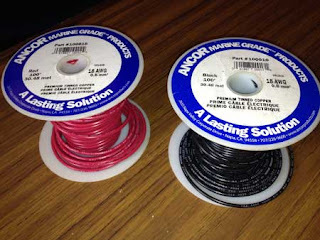 These are the marine wires I use... . If you're doing this install in a RV or cabin, save some money and do NOT buy the marine grade wires/terminals. You don't need it, just get the regular stuff. Decide which terminals are best to use and attach wires to the bottom of the solar unit. There should be a contact box with a surrounding waterproof lid on the underside of the panel. To protect the circuit you can add a fuse on the positive wire, just downstream of solar panel. Then I use plastic zip ties to snug up the wires to the rail and down to the cockpit. Then find a small hole in your cockpit (or drill a small hole) and run the wires into the interior of your boat. Okay - the rest is simple. Lead the wires to the mounted controller, then attach the incoming wires to the ' Solar + and - ' screws (See photo). Then attach a new set of wires on the ' Battery + and - ' screws. Run the battery wires to the battery terminals. And of course, use marine grade ring terminals to fit over the battery posts. As has been pointed out to me by some experts, you also want to include a fuse on the positive wire just before it hits the positive terminal on the battery. This makes for good protection of the circuit. Well, that should finish up your solar panel boat installation project. FAQ: How much will this whole solar panel project cost? Price-wise, you should be just around $240 and you haven't skimped on quality products. Alright, that's about all you need to get set up. $240 is a small price to pay for mounting solar panels on a sailboat. Plus, its an eco-friendly way to keep your batteries topped off. Okay - Good luck with your marine solar panel installation! If you are unsure about your electrical diet (aka. how much energy you require), I also wrote up this page on how best to determine your solar panel wattage requirements. It's basically a guide to estimate how many watt/hours you'll be requiring on a typical day or week on the water. Once you've figured out how many watt/hours you require, you can then determine how large a panel you'll need. 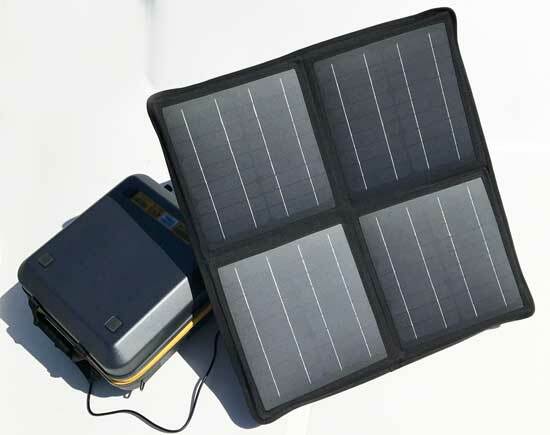 And...if you are interested in a portable solar generator. I have written this review of the best solar generators of 2017. These machines are basically fancy Lithium batteries that can receive a power input from an array of solar panels. Most of these models come with multiple ways to use the power. Generally, you will have an AC outlet, DC outlet and a USB port for phones and computers. These systems are great for back-country travels, long boat trips or preparing for the zombie apocalypse. 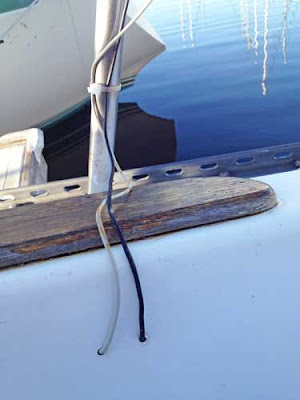 I also want to share a great resource for the boaters that are facing the daunting task of establishing all the electrical wiring on their boat. If you are starting from scratch and need a good tutorial on how to build your electrical circuit properly. I recommend this guide from New Wire Marine. The photos are great. Once you have the foundation of your electrical circuit established, then you can thinking about adding on a solar panel. Don't hesitate, the beauty of this system is that there are no moving parts, which means maintenance is minimal.. Thanks Douglass - all the best..
Great information, thank you! Where did you purchase the white plastic rail mounts? I bought them at a boating store in Seattle - called Fisheries Supply - they may ship. But I would also check your local west marine - they are standard stern rail mounts - they fit lots of other stuff as well as solar panels. Excellent, glad it was helpful. I'm about to post a couple new photos of the system. Everything is still working great. 1. Is a 30w panel large enough to trick charge two 12v batteries? 2. How large an in-line on the positive lead to the battery? Yes, a 30watt panel is large enough to trickle charge 2 12 V batteries. That is the set up I have on my boat - it works great - even in mixed sun/cloud conditions. When you ask 'how large' an in-line on the pos. lead - I am assuming you're asking the guage. I can't give the exact guage that is suited for your set-up. But, I know that the reasonable range is between 10-14 awg. Thanks. Great info! I was actually trying to ask type and size of fuse on the positive lead to the battery. Fingers! Thanks a lot Kavin for your guidance on installing a solar panel on boat. As solar panels are the most effective and the best way of generating electricity these days so everybody wants to install a solar panel of their own. But installing a solar panel in the boat is little challenging. Thanks for sharing the step by step guidelines, it is definitely going to help the readers. The article explains how to hook it up to one battery. But I have a system with two house banks of two bateries each, as well as a starter battery. How do I ensure that the trickle charge gets to all give batteries? Or do you just hook it up to the starter battery? How does this system interact with my charger? I have a similar battery bank - but the two are connected. I connect the leads of the solar panel to my house batteries. However, if they are not connected - then I would connect the leads of your solar panel to the starter battery. Mary, I would get a MorningStar SunSaver Duo controller which can charge 2 batteries (or banks thereof) and set the 2 house banks in parallel on the controller's Batt1 and the Starter Battery on Batt2. This controller has the option to charge 90/10 or 50/50, 90/10 is best for this setup because the starting battery doesn't need much, just enough to top-it-off. I purchased the Renogy 100w panel with controler. I like your plastic rail mounts. Where can I find those. I plan to mount this on the stern of my 73, 27' Catalina stern rail. I got mine at a boat store in Seattle called Fishery Supplies. I just looked it up on their website. Here's the page for those rail clamps. Made by a company called Sea Dog. 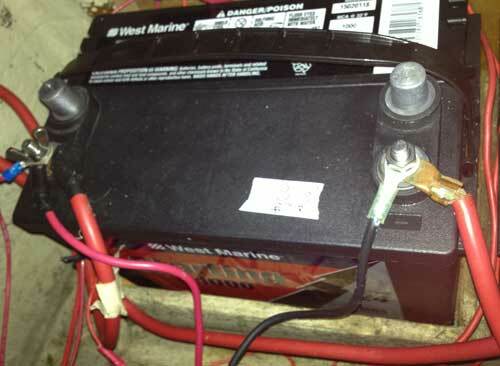 I have a 20 volt panel, single marine battery, with a controler working without problem for about 4 years. While motoring out of the marina the controler caught fire. I did not have a fuse installed as you described in your installation guide. Any idea what might have caused this? That is an odd and unfortunate situation. I am not an expert on safeguarding circuits, however I can weigh in with my opinion. I do think that the installation of a circuit fuse would help prevent over-charge or over-heating happening within the circuit. I think - assuming the over-charge was happening throughout the circuit - that the fuse would have blown, thereby salvaging your controller. However, there is a chance that a diode or some other internal circuit on the controller was the weak link. In that case, I don't believe a downstream fuse would have helped save your controller. I would install a fuse and get yourself a new controller. Just an helpful clarification on the purpose and location of the fuse. The fuse is to protect the wire, and should be placed as close to the origination of the power source as possible which, in this case, is the positive lead near the solar panel. We're all use to hearing about locating the main fuse on a boat as close to the battery as possible; that's because that's where the power comes from. Also, the fuse should be sized based upon the length and gauge of the wire. Thanks for that additional insight on the location of the fuse! Sorry I didn't see this comment earlier. Get your Free Consultation with an Expert! Sunergy Pacific offers premium solar power systems and custom solar panel installation for homes in Santa Rosa, CA. We can provide the answers and pricing options you need to make an informed decision. Thanks for sharing the helpful guide to install solar panels. How lucky am I to have happened upon your easily understood blog. Stupid question: can I mount the solar panel flat on the deck of my Nonsuch sailboat? (I know: don’t step on it!). Will it be worthwhile? (It can’t go on the stern rail).